Orchids, with their amazing variety of colors, brighten up any corner of the room. Long stems and bright flowers arranged in tasteful displays add that perfect classiness to your home. You can make the most of an orchid display, adding a pro touch for effect. Once you know the basics, you can come up with many more variations on how to arrange orchids for display. Orchid Bowl: For this display, the orchids should be in clear plastic pots. Get pots that have holes on the sides, to let the roots breathe. The bowl should be deep enough, as you will place the pots inside the bowl. Arrange soaked moss in the spaces between each pot, so that it covers the empty spaces. Add pebbles around the base of each pot, to conceal them. To prevent the support sticks from sticking out, trim them and remove the flower clips. To finish off the display, tie brightly colored ribbons between the sticks and stems, so that the orchids stay supported. Once you are done, the orchids look like they are growing straight out of the bowl. Orchid Vase Display: Arrange the orchids in a large vase. Common vase choices are tall vases, stout ones with squarish bases, and traditional rounded ones. Slim orchids on stems look graceful in slender glass containers. Use regular decorations like smaller flowers, raffia or ribbons, and ferns, to form the display. Hydrangea is a good choice to fill in the arrangement and contrast with the large orchid blooms. Do not overdo the arrangement though. Orchids are elegant and colorful in themselves; let their beauty speak. 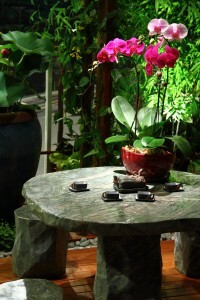 Keep the orchids in a place that is not too dark as the flower needs sunlight. Soft morning sun is fine, but they should not be in direct harsh noon light. Your orchids stay preserved longer this way. Orchid Elegance: To keep your display budget-friendly, you can simply have a three orchids arrangement. Place the orchid stems in a long tubular vase. Just go with whatever arrangement appeals to your eye. To have the orchids spread out on all sides, keep the stems in three different directions. Perhaps one can stand straight up, and the other two bent slightly. Or, have all the three stems tied tight together, and bowing downwards from the container. With orchids, it is best to go for those that bloom at the same height and are at the same growing stage. You do not want one that is just a bud and another that is fully grown in the same arrangement, for example. Moisten the orchids before putting them in the display; that way they will remain fresh for a longer time. But do not add water directly to the leaves. Drain the display once every ten days. Moss and Raffia Display: This is a simple display that you make using two flowering orchid stems. Try to use stems that are more or the less the same height. Place the potted orchid inside a Cachepot, so that the roots get enough air. The Cachepot is large and you can directly place the pot in, which means you do not need to re-pot. Instead of support sticks you can use something like a simple birch branch. Put it in place at once after removing the support stick. The idea is to just replace one support system for your orchids with another. Take natural moss in small quantities and wrap it around between two stems, then tie it n place with raffia or pretty ribbon. To give the display a finished look, you can simply put some leaf-shine on the leaves. They will look nice and shiny. The state of the leaves give you a fair idea about how your orchids are doing. If you find the leaves changing color, from a bright green to darker shades or brown, your orchids may be at risk. To stop this from happening, you can try humidity trays to give orchids that extra moisture. Do not water the leaves directly on their surface. The best part about orchid displays is that, when you keep them out of direct sun and ensure they are moist enough without being watered, you can preserve their fresh look for quite some time. What’s your favorite way to display your orchids? Leave a comment below and tell us about it. Are you meeting your orchids needs? Read the 6 Laws of Orchid Care to find out.